"After I got in the car, I took the fabric I'd bought out of the bag and stretched it across my lap so I could sneak looks at it on the way home. Before I'd taken the first cut, I'd already transformed it a thousand times." This is terrific! Thanks for the quote and the recommendation. I think every quilter has done that at least once. 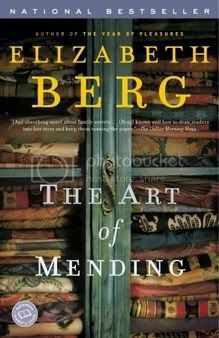 The book sounds like a good read although I am not a fan of mending. It's metaphorical mending, Joyce--the mending of relationships. It just happens the narrator is a quiltmaker whose specialty is restoring/repairing/mending quilts. Love the quote (no, you're not the only one, Jane Ann) and love the cover! ROFL, don't all of us with that OCD do that??? I thought it was "normal" ROFL Will have to check out that book. THanks for the tip.